The slow demise of baseplate-based LEGO buildings provides a more dynamic experience, especially with Apocalypseburg which is set in the wastelands. An irregular footprint can more easily blend into a display or play area with other structures and vehicles. 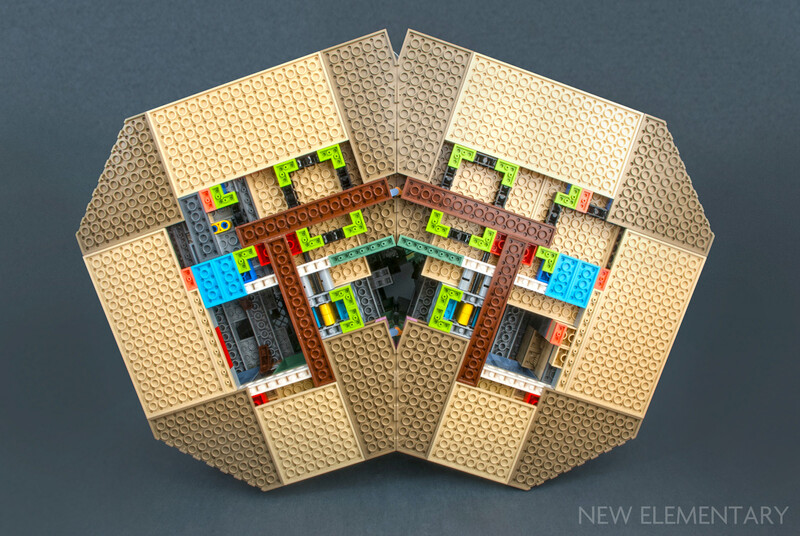 LEGO designers have done a great job downscaling and adapting the enormous film model to manageable proportions and building techniques. The set uses a lot of large elements which makes the 3178-piece count seem low compared to the overall size of the set. Building techniques in 70840 Welcome to Apocalypseburg! There are no obviously surprising techniques used in the set. 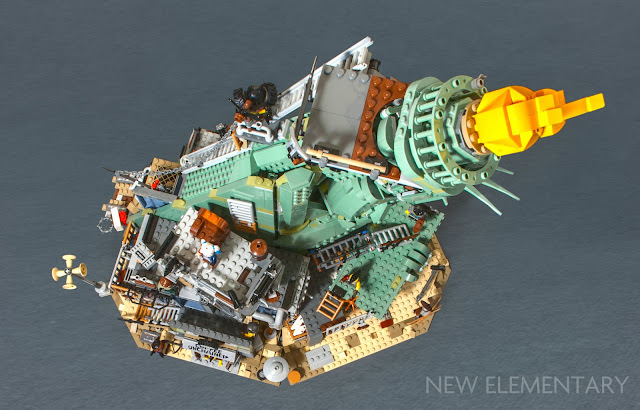 As expected, Technic bricks and liftarms are used for the sturdy armature of the structure and the designer used the Pythagorean theorem to get the statue’s torch and head angled at ≅ 55 degrees while staying within legal connections. This unusual angle closely matches one of the rarely used System slope elements, Slope 6 x 1 x 5 55 (Design ID 30249). The “55” is actually more like 55.1755108°. 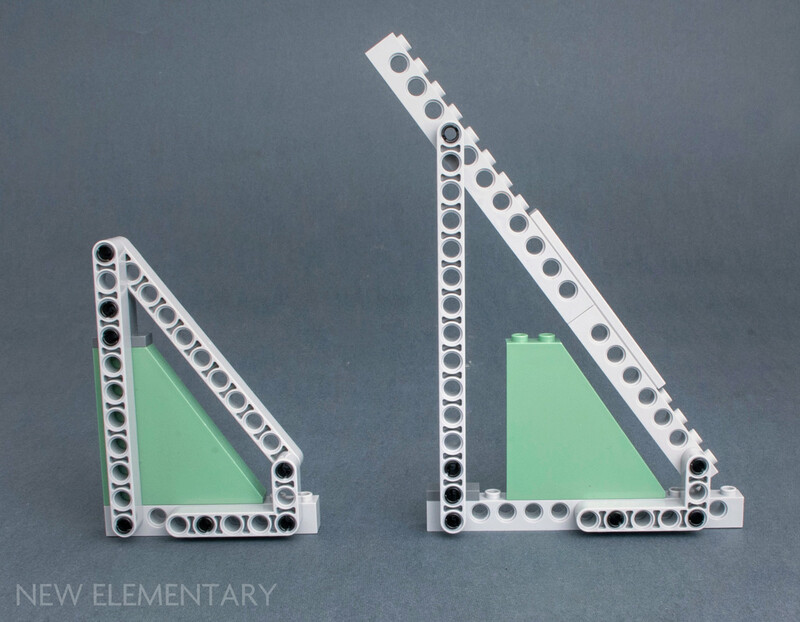 If you are wondering why System slopes are not designed to perfectly match Technic beam angles, this is because System slopes are just basic reductors for LEGO units. 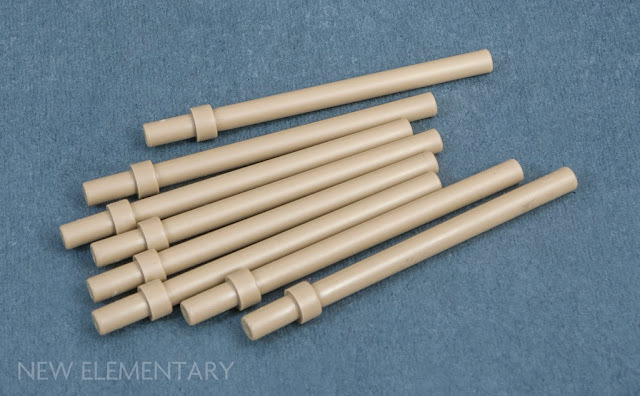 In this particular example, it connects a length of 4 studs and a height of 6 studs (minus 2mm bottom chamfer) and the angle is whatever comes out of that. More likely than not, it will not form a Pythagorean triple. Technic on the other hand works best within the Pythagorean triple so that it can connect to other structures in the “grid” with right angles, and form a sturdy construction. Because three beams are hard to connect directly to each other, those triangles usually end up as trapezoids which are used in this set to roughly match the slope’s angle. The rather large Slope is also impossible to match with other System elements from the wedge brick and wedge plate families. 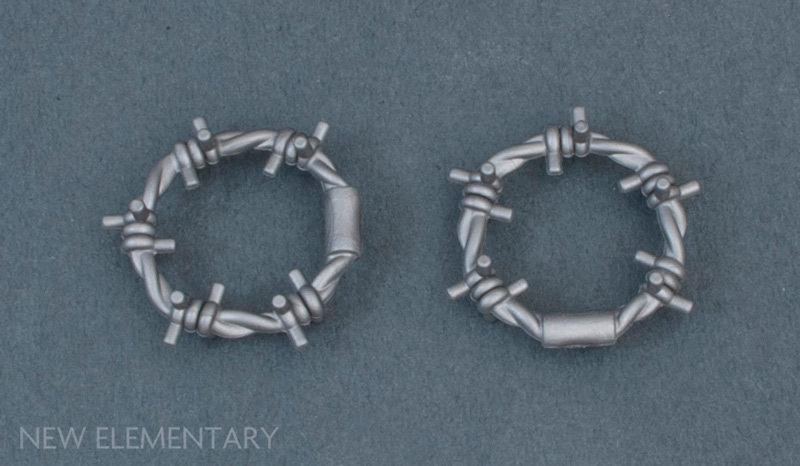 In this set, any gaps left by the inconsistency of angles in pieces used to cover up the internal Technic armature can conveniently be excused by the worn appearance of the statue. 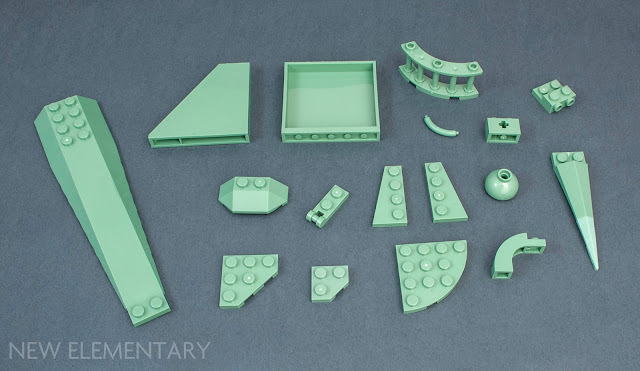 The only completely new moulds present in the set have already been covered in recent New Elementary posts: the 2x2 turntable and the altered mould for the 1x4 plate with 2 studs, so instead let's focus on the recolours. Recoloured pieces in 70840 Welcome to Apocalypseburg! Welcome to Sand Green Bonanza! Back in 2014, Sand Green was a popular, but somewhat rare colour. Most of the sets that had large amounts of this shade were retired by then, and expensive to begin with, so the market dried up quickly. From 2017 to 2019 Sand Green went from niche to mainstream again. 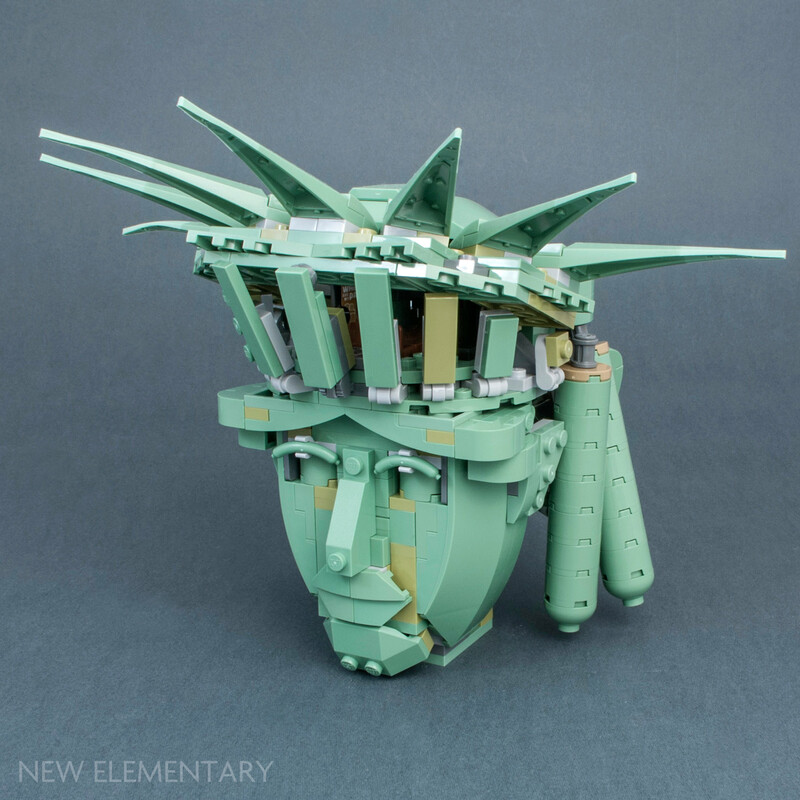 The recent Architecture set 21042 Statue of Liberty alone contributed a large push of Sand Green parts back into production and introduced dozens of new pieces. If you think that was plenty, wait until you see what the Apocalypseburg inventory holds. In total, 17 elements are new in Sand Green. The set also re-introduces six Sand Green elements which haven’t been produced for 14 to 17 years. Sand Green’s closest analogue colour is Olive Green which is used to break up the monochrome appearance and add some texture to the post-apocalyptic statue. 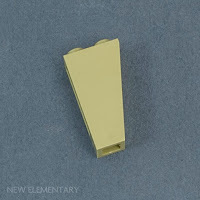 One of the parts used for this is the 2 x 1 x 3 Inverted Slope 75 (6259361|2449), and this is the only newly re-coloured Olive Green element in the set. 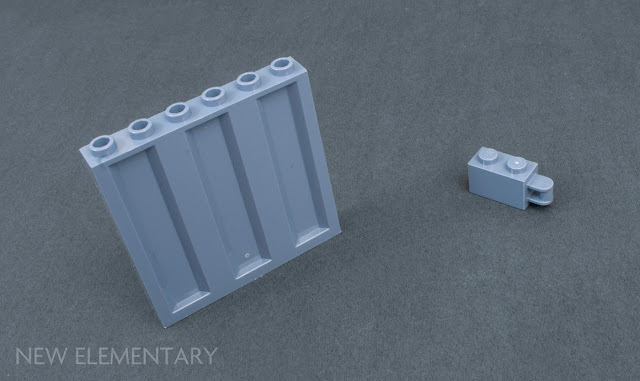 There are two re-colours in Sand Blue, one for the 1x2 Brick with handle on end (6248968|34816), and the other for Panel 1x6x5 Corrugated (6258378|23405). Sand Blue is a great colour for this panel as it resembles the sun-faded paint of old shipping containers. Brick, Modified 1 x 1 x 1 2/3 with Studs on 1 Side is now introduced in Earth Blue [TLG] / Dark Blue [BL] making it the 14th re-colour of this fairly new element. This element is also used in some of the other LEGO Movie 2 sets where Earth Blue serves a more essential role. 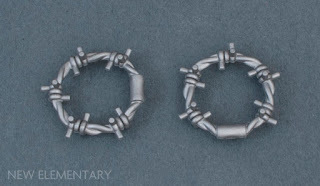 The set resurrects a piece we haven’t seen since 2010; Minifigure, Utensil Barbed Wire Coil (6203202|62700) in Silver Metallic [TLG] / Flat Silver [BL]. There is no Design ID on the element, so there is a possibility the new one has a different number. There are only two in the set, so don’t set your hopes high for a major price drop just yet. Slope 45 1 x 1 x 2/3 Quadruple Convex Pyramid (6256734|35344) can now be found in Reddish Brown which is surprisingly only the second solid, non-pearl colour for this part. Not quite new, but worth pointing out, are the eight Bar 6L with Stop Ring (6254772|28921) scattered through the set newly re-coloured in Sand Yellow [TLG] / Dark Tan [BL]. These first appeared in 75215 Cloud-Rider Swoop Bikes in 2018. 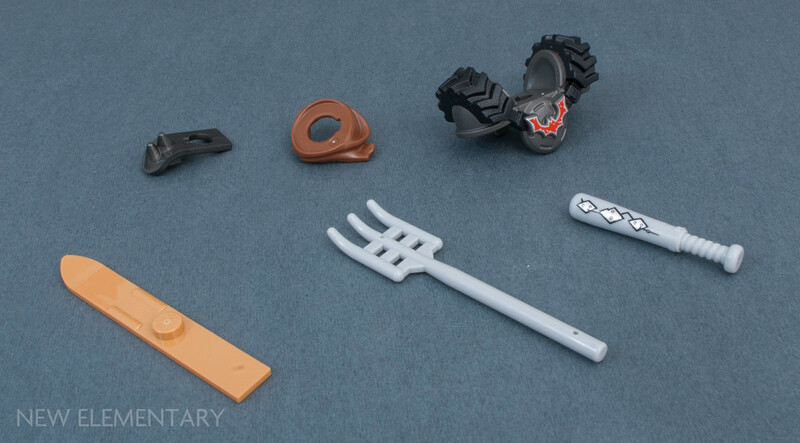 The only new 2019 moulds present in the set have already been covered in recent New Elementary posts: the 2x2 turntable and the altered mould for the 1x4 plate with 2 studs, however the 12 minifigures in the set bring some interesting new and recoloured elements with them. LEGO Minifigures in 70840 Welcome to Apocalypseburg! The Armor Shoulder with 2 Spikes on 1 Side (6248797|39260) is a new piece for The LEGO Movie 2 sets. Lucy sports a new Scarf Short Wrapped (6248730|34685) in Reddish Brown, while Batman rocks some seriously extravagant armour (possibly inspired by Tina Turner from Thunderdome?) (6253757). The Utensil Ski 6L (6258689|18744) is new in Medium Nougat [TLG] / Medium Dark Flesh [BL] which makes a great sign post. The Pitchfork (6228920|95345) in Medium Stone Grey [TLG] / Light Bluish Gray [BL] makes a re-appearance after 75222 Betrayal at Cloud City, and Harley Quin comes with a cool printed Baseball Bat in Medium Stone Grey (Element ID 6253969). in 70840 Welcome to Apocalypseburg! There is an abundance of stickers, and some of them are crucial for the set’s film references. They are spread evenly throughout the build. 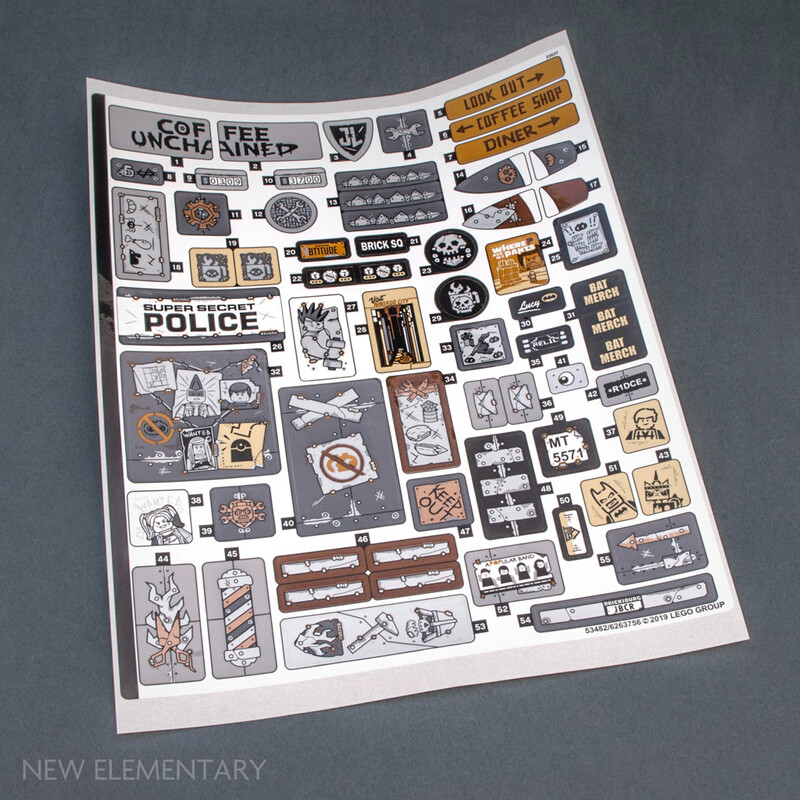 Most of the stickers are specific to the LEGO Movie theme, so they wouldn’t have much use being printed anyway. 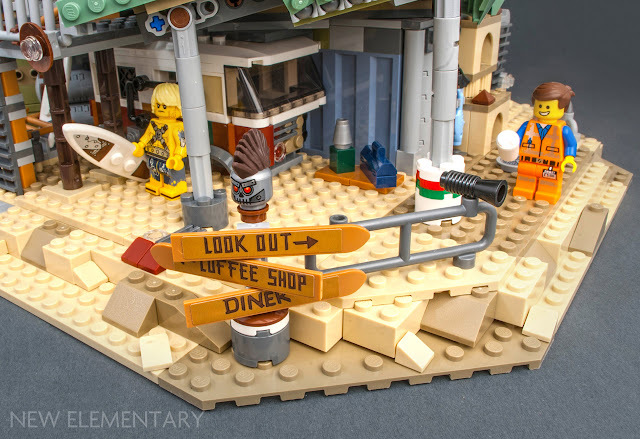 The set’s budget frames were probably used more efficiently for the exclusive minifigures. 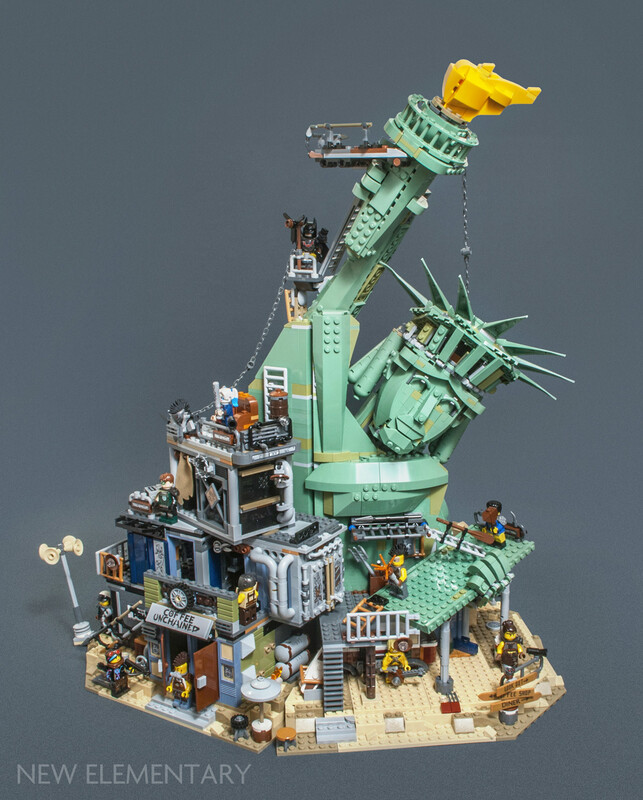 Large LEGO sets can be notorious for repetition during the building process, but allow Apocalypseburg to break the habit as one of the most entertaining experiences. The set follows a style of busy, detailed structures in a controlled environment which is a method successfully trialled by 70620 Ninjago City. Every segment tells a story and you can’t be sure what it is until it is built. What might seem like a cute torture chamber, turns out to be just an improvised barber shop. 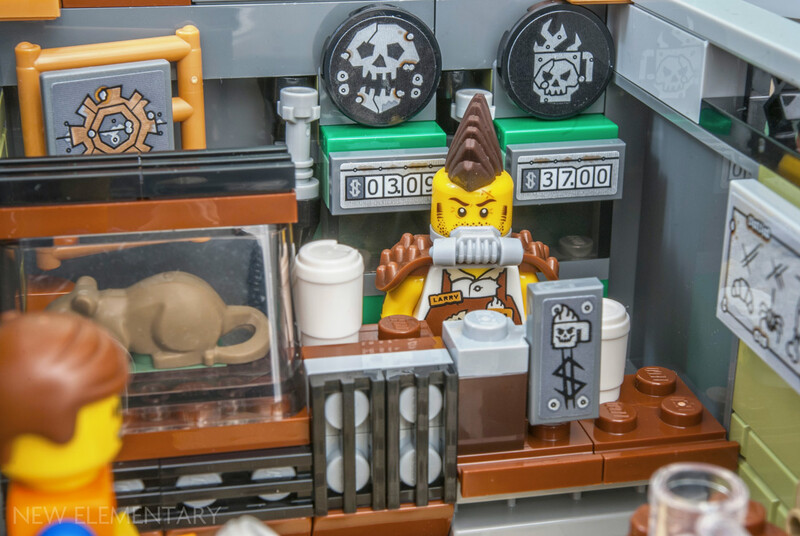 Allowing comedy from the film to seep into the set is a bonus perk of the LEGO Movie 2 theme, and Apocalypseburg makes the most of it by packing every room with Easter eggs and funny pop culture references. The LEGO Movie 2: The Second Part 70840 Welcome to Apocalypseburg comes with 3178 pieces, 12 minifigures and retails for 299,99 € / £279.99 / $299.99, available 1 February 2019 with early access for VIP members starting now. Great review of the pieces, colours and techniques but I need to know: is it swooshable?! Haha! Certainly doesn't look aerodynamic. In the size?? 21042 is at a much lower scale. Yeah, the lips on this one are bigger than the entire face on 21042. This one is probably something like 6 or 8 times the scale of that one. (I'm a different Unknown person than the one who was surprised at the difference). Perhaps one was based on a stock photo of the one in Las Vegas, and they thought we wouldn't notice the difference. This one is definitely past its sell by date. Wow. That's it? Forget the printed parts, I expected more new unprinted parts from a set this size...and sand-green. Eh, you're probably right about the minifigs. There are 9 characters who only appear in this set, which probably amounts to 27 printed elements right off the bat. I don't know about Emmet or Wyldstyle, but Batman definitely has a different torso and legs than his "You're Welcome" version, as these have brown wrists and boots. Add in Harley's printed bat, and that's a likely 30 printed elements that are unique to this set (well, maybe some of the faces are reused from elsewhere). And where I'm sure some of the non-minifig elements get used multiple times throughout the build, the same can't be said for any of these minifig parts. There's definitely more new parts in this set than the ones mentioned, even if some of them are also shared with other new sets. For one, I spy Vibrant Coral plates in the base that seem to have gone unmentioned in the review. Although this build at least keeps the focus on the most interesting aspects of the statue. The real statue is just about 80% imitated draping cloth, anyway. Ironically, from what I've read, new artists hate to draw nudes, instead preferring to cover them in draped cloth because it's easier. And then after they've learned a bit and developed their craft, they hate to draw robes, instead preferring to draw nudes, because they figure out that it's really hard to draw the cloth draped properly if you don't have a solid understanding of how the cloth drapes over the human form beneath it. I imagine the same holds true for sculpture, so from an artistic standpoint, sculpting flowing robes like that and making them look good is extremely difficult. Yeah, the reason for the flip is that new artists aren't used to drawing the human form, and feel like they're not capable of doing a good job. Draped cloth seems like a great alternative because it hides all that pesky anatomy behind something that's vague and formless. Once they really start to learn, they realize that the cloth isn't just a rumpled tarp in a garage, but that it follows the shape of the human form. To properly depict draped cloth, you really have to understand whatever it's draped over. For people, that means you really kinda do need to master the human form before you an hide it. The same holds true for a car hidden under a car cover, a gift-wrapped rocking horse, or a tarp draped over gardening tools. Whatever is under the cloth is going to heavily influence the shape it takes, and if you're trying to depict it as an art form, you can't adequately convey what's hidden from view if you just draw abstract rumpled cloth. I'd never heard of croquis before (and spellcheck doesn't seem to like it), but yeah, that seems like it might be helpful in that regard.